Have you ever heard about women to choose to have a cesarean section for "personal convenience", without medical reasons? C-sections have been on the rise for decades now, and sometimes it is said that women who think they are "too posh to push" (must be a British expression, but it sure sounds like fun!) 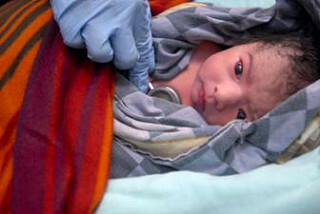 are responsible for large numbers of cesarean births around the world. But a new meta analysis showed that hardly any woman would actually prefer to give birth by c-section, and choose it over a vaginal birth without medical reasons. The United States now has a national c-section rate of 32 percent, which means that a third of all women giving birth now do so by cesarean section. The country with the highest percentage of c-sections is currently China, which has a 48 percent c-section rate! But what do mothers thing about surgical births? What are their actual preferences? Dr Agustina Mazzoni and her colleagues from the Institute for Clinical Effectiveness and Health Care Policy in Buenos Aires, Argentina, looked at data from almost 20,000 women around the world. Their study, published in the Royal College of Obstetricians and Gynecologists (BJOG) looked at the birth preferences of women in North and South America, Asia, Europe, Africa and Australia. Let's take a look at their findings. Out of all the data analyzed, the research team found that a total of 15.6 percent of women would prefer to give birth by cesarean section. While that is certainly a significant minority, it is very clear that it is a minority. It was interesting to see that a higher number of women in Latin America, where mothers are not actively engaged in the medical decision making process and are largely just told to listen to their doctors, preferred c-sections a quarter in total. Still a minority, though. Perhaps, given the fact that childbirth recovery after a c-section takes much longer, and the operation is not without risks, are the reasons why women don't prefer them. But who knows? Of those women who had already had a c-section before, a slightly higher 17.5 percent would prefer another cesarean. Most still preferred to give birth vaginally after a c-section. Women in high income countries were least likely to prefer a surgical birth, with a total of 12 percent thinking this was the best way to give birth. The researchers' conclusion was that, "although cesarean section on demand has been suggested as a relevant factor for the increasing cesarean section rates, it seems unlikely that this explains the high cesarean section rates in some countries and regions."